The lineage viewer is provided by SAS Lineage. The relationship information that is displayed by SAS Lineage is taken from the Relationship database that is a part of the SAS Web Infrastructure Platform Data Server. SAS Lineage can display most types of SAS metadata. This data includes models, rule flows, and data objects, including columns, tables, external files, stored processes, and more. Open the rule flow and click . If you are not already signed in to SAS Lineage, you are prompted to sign in. Enter your user ID and password, and click SIGN IN. 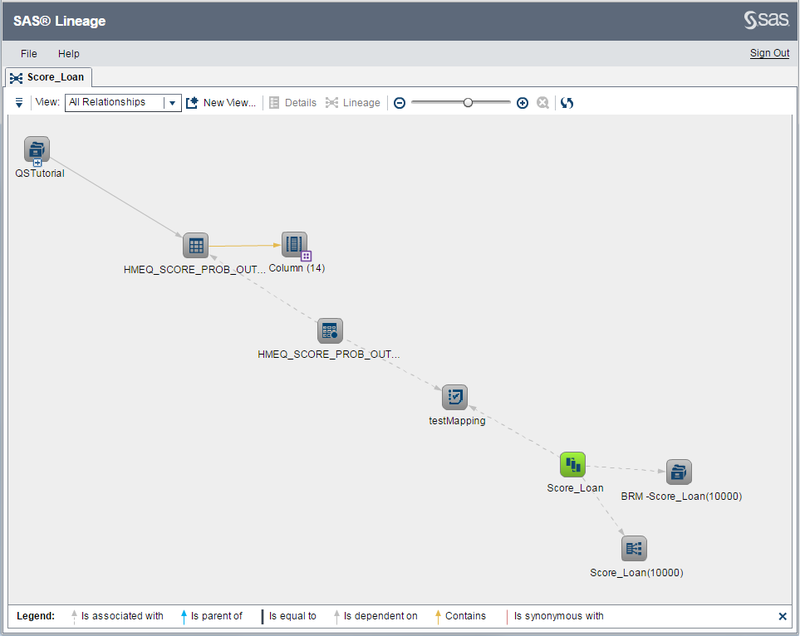 SAS Lineage displays the All Relationships diagram for the rule flow. For additional information about SAS Lineage, click Help or see SAS Lineage: User’s Guide. The following image shows the All Relationships diagram for a simple rule flow with one rule set.